Freedom Cry DLC - the biggest and the most intense add-on for Assassin's Creed 4 - today will be released as a standalone game for PS3 and PS4. The version for PC gamers is coming a little bit later - on the 25th of February. But the gameplay trailer of this project has been already presented. Freedom Cry DLC is a new page in the Assassin's Creed history. This short game introduces us to Adewale - another one hero in the universe of the game series. This character was a slave, but now he is an assassin, and the only thing he wants is to find a justice and enslave as many bondmen as possible. Together with a meeting of the new hero, Freedom Cry DLC allows us to explore the various locations, try yourself in the numerous missions and meet lots of interesting characters. 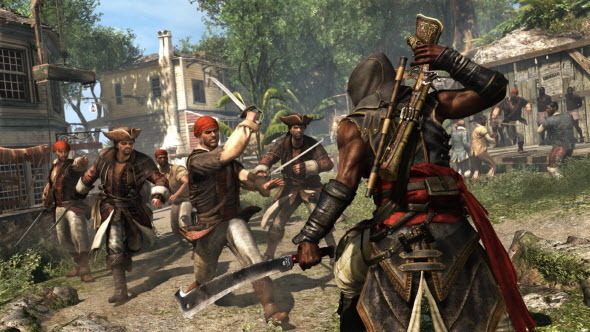 Adewale will get a special weapon, and his battle style will differ from the one of other assassins in the series. He is very strong physically, and he also knows the tragedy of slavery, and so fights with all his might. But of course, you will be able to choose the way of walkthrough by yourself, so if you don't want to play aggressively, you can try to pass the missions in the stealth mode. Freedom Cry DLC is also available as an add-on to Assassin's Creed 4, so if you want to play on Xbox 360 or Xbox One, then you should buy this content as DLC, but not the standalone game.